SJD teachers have put together a list of suggested and optional items for your child. The PAC has organized with Staples to collect and package those exact items for you which will be delivered to your child’s classroom at the start of school. This is a fundraiser for the PAC. Each package has a $5 fundraising fee included. All monies raised will go towards enhancing your child’s experience at SJD. If you are an existing parent who has already ordered from the online lunch program, skip the remainder of this step. If you area new parent or an existing parent who did not order online this school year, register at www.sjd.hotlunches.net, underneath the login section. Access code is SJD2017. Go to www.sjd.hotlunches.net and log in. Click on students. Add new. Under Class drop down menu, choose “the grade level for the 2018/2019 year”. Under your child’s name, next to “2018/2019 Supplies, click Order. Scroll down to place your order for your “grade level package” and optional items. Please pay at time of order. 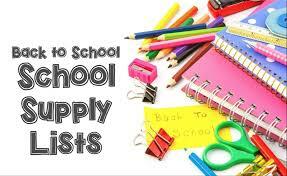 Your supplies will be delivered for your child in their classroom in September. If you have any questions during ordering, there is a “Support Request” option under the Help menu. Deadline for orders is June 23, 2018 and the school supplies will be delivered to your child’s classroom on Friday September 7th.